Bah, it was all going so well. 25 hours in and now I can't go anywhere near Embershard mine without CTD. Time to re-evaluate. Is there a rough mod order available for this setup I can compare my list with? Additionally I removed a couple items all together, namely Footprints, Frostfall, INeed, Bathing in Skyrim. After doing this I noticed a significant improvement in game smoothness and no more endless loading screens. I have not optimized the armors as yet. In reading this thread with a desire to add Perma (I enjoyed SkyRE) on top of my choice of setup, am I to understand I may need to drop ASIS to best incorporate the Perma setup? I am mainly looking at the possibility of time saving measures as I add a couple CORE mods into the SRLE setup, JK's town textures from REGS, and some of my own personal choices. I am looking at the conflict resolution tutorial and pages, and figure if I am rebuilding patches and such, if I need to remove ASIS, now would be a good time. This setup works if you place the mods in the Pack after the mods from SR:LE, REGS, or SR:LE + REGS. I do not personally use ASIS and believe it's pointless with PerMa anyways in regards to the reasons Neovalen included it. I assume you've followed this? I've followed a number of tweak and optimise pages, but STEP "endorsed" pages as I know some people like to say this and that works but actually don't know the implications of certain settings. Edited by Erenar, 03 March 2015 - 05:29 PM. 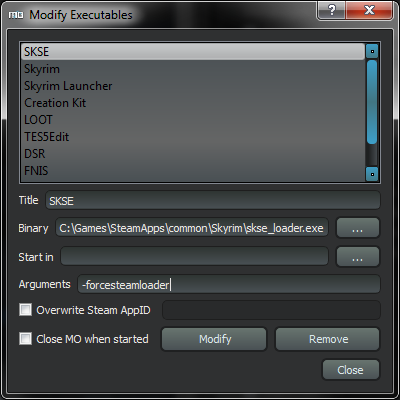 So did you try the -forcesteamloader argument to your skse executable as discussed in the thread I linked? I'll admit I didn't. From what you wrote, that seemed to only be necessary if the memory blocks weren't showing as 512 and 256. Mine showed the correct values. I'll give it a try as it can't hurt. Btw, the game runs fine in general, it's only just outside Embershard mine that it crashes or when trying to save there. I'm wondering if Helgen Reborn is causing an issue so I might see if I can progress that quest to check if it changes anything (ie reduces script processing or bandit generation)... I'm up for trying anything to be honest. Also, the issue lies at the entrance, not exit of Embershard. It seems very cell specific. Edit: Crash still occurs when entering the entrance (not exiting it if entered from the exit cave), also when trying to save just outside the entrance. Just about to try leaving the entrance and moving to Riverwood before attempting a save. Edited by Erenar, 04 March 2015 - 05:04 PM. Just to note: Version 1.2 of Perma is out. That fixes a few things, including T3nd0's SNAFU with Wintermyst. However it introduces a few more, like an occasional inability ro lockpick at all, (which there's a hotfix for) or more annoyingly, no xp gain for successful lockpicks once you get the ability to lockpick working. Have rolled back to 1.1 with the Wintermyst fix for now. Thank you beta testers... hehe. Yeah I think I've run into every possible issue so far with this one. It's not helping when T3nd0's made two screwups with 1.1 and 1.2 releases that needed hotfixes. Still, I'll punch along with it. Most of what people are claiming as issues are either their own mistakes in modding or java installations. Edited by Nozzer66, 04 March 2015 - 10:01 PM. Yes, it works well (fantastic) on my end. Just need time to sort my assignments out, which isn't a bad thing it'll let the authors fine tune things a bit more. @ Erenar - thanks for the info list. I have about finished my "weed" through the variety of CORE and SRLE mods + a few personal faves that I wanted.... narrowed a lot down for ease of resolution. Only thing I am taking from REGS is the JK All in one I believe. @ Phazer, thanks for the encouragement/advice. Next up on the docket is to make a conflict resolution between the added items and the SRLE setup I believe. Don't tweak it weekly. Use 1.1 with the Wintermyst fix and leave it like that till we get a good solid build of Perma.